A contemporary, self-catering cottage provides you with an enchanting holiday. Fully stocked to provide a home away from home with its own private outdoor space with tables, chairs and gas BBQ. Oil fired central heating. If you don't want to cook our on-site chef is happy to prepare delicious home-cooked meals for you to have after long, fun days exploring Pembrokeshire. Within a 10 minute energetic walk of Saundersfoot and a short drive to numerous blue flag beaches and fantastic seaside resorts such as Tenby as well as family attractions including Oakwood Park, Folly Farm, Manor House and Heatherton Park. Cowslip Cottage Sleeps: 4 Bedrooms: 2 1 double bed, 2 single beds. Family bathroom with power shower. Free Wi-Fi, Flat screen TV. Full-size oven, hob, fridge, microwave and dishwasher. Adjacent parking. Full-size cot, high chair or toddler bed are available free of charge. There is plenty of room for all of the family on Meadow Green Farm as we have two additional holiday cottages available. The three cottages sleep up to 14 persons plus cots. This makes us a perfect option for larger families who are looking for extra space on their holiday. See: Meadowsweet Cottage, Property #8144783. Hi, our names are Tom and Katie, we have been living in Saundersfoot for a few years now and love everything about this area! Meadow Green Farm is ideally situated to offer the best of both worlds. We are in the countryside yet minutes from Saundersfoot beach and harbor with an array of bars and restaurants. A stroll into town will take approximately 7 minutes and there are several routes to take for those wanting to explore the woodlands. We are nestled in the Pembrokeshire national park and have various walking paths running through the grounds of the farm that join up with the famous Coastal Path with its breathtaking views. This part of West Wales is a little slice of paradise and caters to a vast array of holiday makers. Explore the history of West Wales and visit Pembroke Castle, Tudor Merchant House, Caldey Island, St David's Cathedral, Carew Castle and Tidal Mill, Manorbier Castle, Saint Govan's Chapel and the various Norman Churches and ruins. Enjoy the scenery at Colby Woodland Garden, St David's, Cresswell Quay or Bosherton Lily Ponds. Play on the spectacular award-winning beaches including Barafundle Bay. Moreover, we are only ten-minute drive to beautiful Tenby. Also situated nearby are attractions for the whole family, including Folly Farm, Heatherton World of Activities, Blue Lagoon Water Park, Oakland Theme Park, Manor House Farm, Dinosaur Park and many more. After a busy day of exploring come back to your own cozy cottage and unwind. We are perfect home away from home for the entire family. We have a play area for the children, equipped with various toys, games, trampoline, swings and outdoor play equipment. We love animals as well so feel free to bring your furry friends along too for a proper family holiday! If you need to head out for the entire day we are happy to check on your pup, even take him or her for a walk if requested. We can organize some time with the sheep for the children as well. We also provide free Wi-Fi. We have two other cottages on the grounds so all three can be rented for the entire families get away, sleeping 14+. The family bathroom has a walk in power shower, basin, heated towel rails and w.c. Spacious and comfortable sitting room/dining room. 2 and 3 seater leather sofas. Flat screen TV and DVD player. The kitchen has a comprehensive range of kitchen and table ware with fridge, hob, oven, microwave and dishwasher. Children's high chair, plates and utensils are available. Golf courses are nearby at Tenby, Heatherton and Trefloyne. Ample parking is adjacent to the cottage. The cottage is on a single level with no internal steps. The garden and children's play area are all on the same level. How delighted we we to stay with Tom & Kate at the Cowslip cottage.. such a lovely welcome for us and our 3 Daxies. We had everything we needed at the cottage to enjoy and relax, definitely will go and stay again. Very attractive, well equipped and comfortable holiday cottage in an ideal environment. The cottage lived up to our hopes and expectations. Our hosts were friendly and obliging without being intrusive. This was a very enjoyable holiday in every respect. as described, very nice property. despite the weather (strong winds), we had a very enjoyable stay at the farm, Thomas was most helpful with any requests and made us feel very welcome. many thanks, hope to visit again. Lovely setting, Tom and Katie very welcoming. Nice relaxing few days away. Manorbier, Freshwater East, Barafundle Bay, Caldey Island beach, Amroth, Pendine Sands and Tenby's North and South beaches. The Pembrokeshire National Coastal Path continues through Saundersfoot. From the western end of M4 motorway a further 40 miles. The Severn River Crossing near Bristol is 2 hours drive away. British Rail at Saundersfoot less than 1 mile. Saundersfoot village, harbour & sandy beach is 15 minutes walk downhill or 4 minutes by car. Tenby is 7 minutes drive. Narberth 17 minutes and 50 minutes to historic St. Davids. The beginning of the coastal path at Amroth is 50 minutes walk from the cottage. Pretty Saundersfoot village and beach are a 15 minute walk away. There is a bakers, butchers, chemist, Spar, Tesco Express, pubs, restaurants and numerous interesting shops. GP surgery and bowls club. Further afield there are beautiful Pembrokeshire beaches and sailing trips to Caldy and Skomer Islands. Family enjoy the amenities at Folly Farm, Manor House Zoo, Heatherton and Dinosaur Land. Booking Notes: Please see our website for up to date availability and prices. Changeover Day: Saturday is change over day. Arrivals after 3 pm please and departure before 10 am. 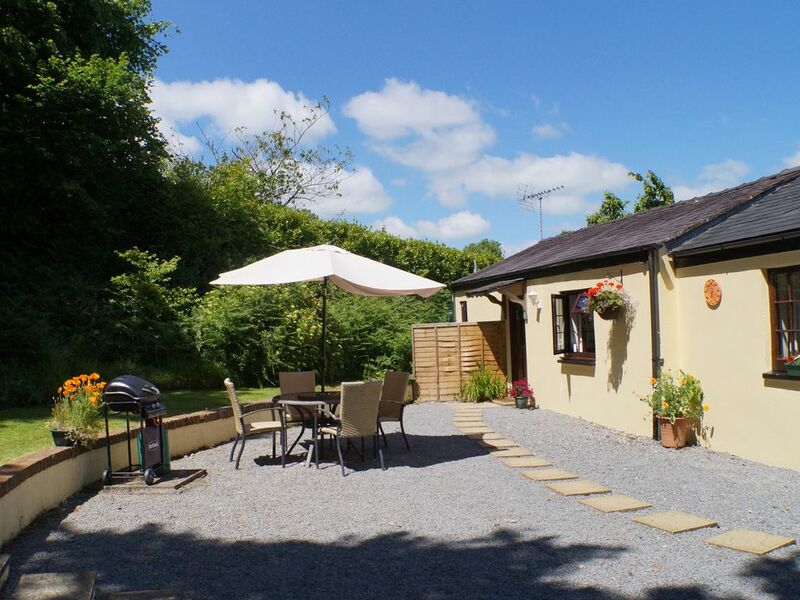 Notes on prices: Prices for Cowslip Cottage for 1 week range from £415 to £918. Availability and prices are also shown on our web site.